Made in USA, SPF-15 lip balm provides UVA & UVB protection. Lip balm features a scratch-resistant, waterproof label with pre-printed generic stock logo. 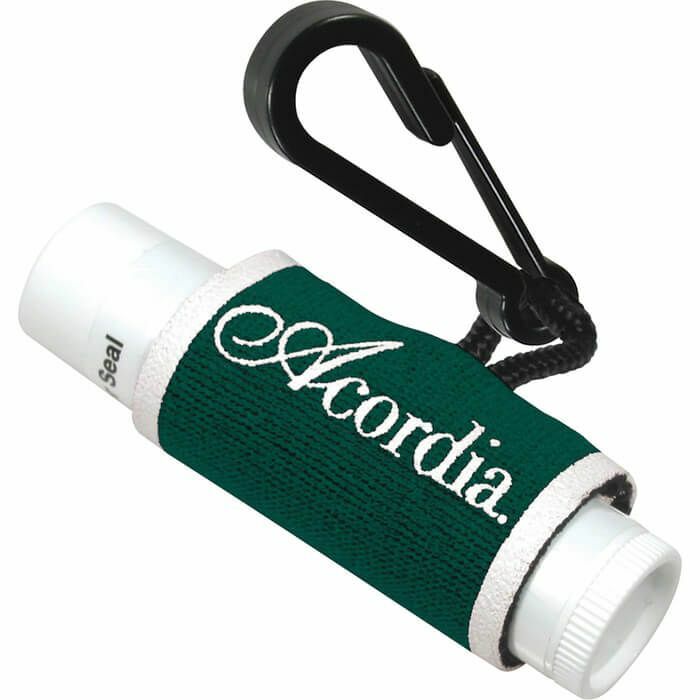 Neoprene sleeve with travel clip (included) available in 13 different colors can be decorated with a maximum 4-color imprint. Includes Tropical-flavored lip balm. Rich in Aloe, Vitamin E & PABA-Free. US Patent #D502,311 5. Item ships with lip balm inserted into neoprene sleeve. Available for shipment within United States (including Alaska, Hawaii & Puerto Rico). Production Time 5 business days! Requesting a virtual proof will delay your order by 2 business days. Estimated delivery date will be voided if PMS matching is required and production time will extend to 5 work days after proof approvals.